If you are unfamiliar with cloth diapers like I was then you probably picture the cloth diapers that your grandmother used; you know, the big white cloth with the terrifying looking safety pins? However, cloth diapers today are NOT your grandma’s cloth diapers! They come in many styles and are much easier to use then those old safety pins! 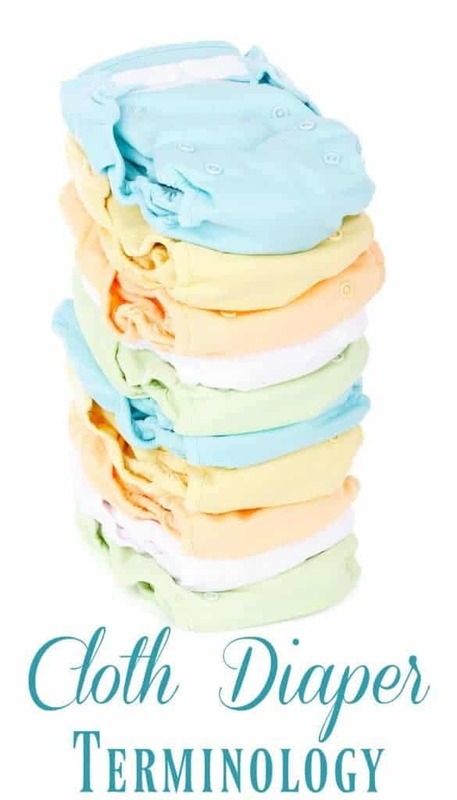 Of course, with all the variety comes confusion, at least to those who are not already in the cloth diapering world. Prefolds, Pockets, AIO’s, AI2’s??? What in the world are these mama’s talking about? 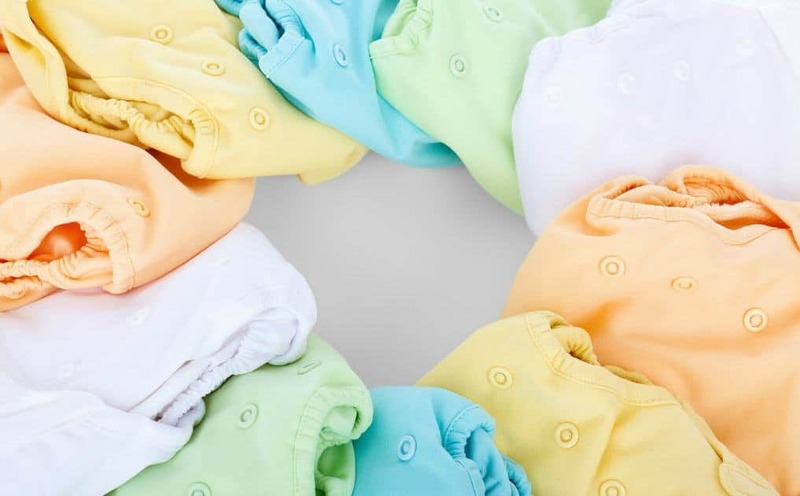 All the terminology can drive newbies away, thinking cloth diapering is too confusing. Today we are going to go through each item, name, and terminology one by one. By the end of this post you will be a pro or at least you will finally know what an AIO is. Flats – These are your grandma’s cloth diapers. Flats are rectangles of material that you then need to fold and fasten using either safety pins or Snappi (more on Snappi’s below). These are not waterproof and thus need a separate cover. These dry fast and are one of the cheapest options in the cloth world. Prefolds – Much like Flats these are rectangles of fabric but have had some of the folding done for you. You still need to fold and fasten these yourself. Prefolds are what you will see in baby stores that many people use for burp cloths. Prefolds are not waterproof and need a separate cover. 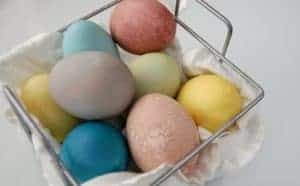 Like Flats, these are fast drying and cheap. Fitted Diapers – Picture a disposable diaper but made out of fabric. These diapers are hourglass in shape and close with Velcro or snaps. Fitted diapers are not waterproof and require a separate cover. These are still pretty cheap and yet are closer to a disposable diaper and therefore less intimidating. Pocket Diapers – These are much like disposable diapers in shape. They close with either Velcro or snaps. 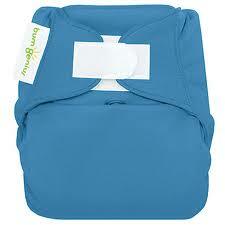 Pocket diapers have a waterproof outer layer and the inner layer consists of fabric with a pocket. This pocket is where you stuff your absorbent insert. This insert comes out of the diaper for cleaning and makes drying time quicker. AIO’s – Picture a disposable made entirely out of cloth with a waterproof outside and you have an AIO. AIO stands for All In One and it is just that. If you want a diaper that is closest to a disposable then the AIO is the diaper for you. Anybody who can put on a disposable can put on an AIO. AIO’s however, do take longer to dry as you cannot separate any of the absorbent layers and they tend to be the most expensive option. AI2’s – These are similar to AIO’s except that the absorbent insert is removable. AI2 as you might have guessed, stands for All In Two. AI2’s consist of 2 pieces; the waterproof cover/shell and the absorbent insert. The insert is usually snapped into the cover/shell, however it may also be simply laid in. AI2’s take longer to dry then Prefolds or Flats but they dry faster then AIO’s because the absorbent part is removable. The real advantage to AI2’s is that since the insert is removable you can reuse the same cover/shell over and over. For instance, if you need to change your baby you just switch out the insert and keep the same cover. Hybrids – Hybrids are usually lumped together with AI2’s as they usually are an AI2. Hybrids consist of a cover/shell just like an AI2 but the insert has two different options. One option is cloth in which case it’s just an AI2, the other option is a disposable or biodegradable insert. 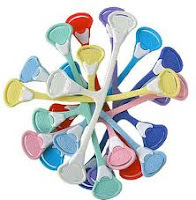 These inserts can be used and simply thrown away or sometimes even flushed down the toilet. Hybrids are great for those who do not want to create as much waste as disposables but are still leery of washing cloth diapers. They are also great for long vacations when washing would be hard to come by. Hybrids when used with disposable liners tend to cost as much as disposables. Those are the basic styles of diapers. Now we’ll talk about the other terms that come up when you are in the cloth diaper world. 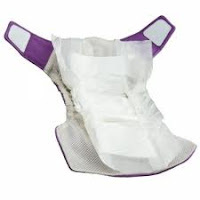 Diaper Covers – These are needed by all non-waterproof diapers (flats, prefolds, and fitteds). Diaper covers are just a waterproof shell that goes on over the diaper. Snappi – The modern alternative to safety pins. This plastic device is used to hold flats, prefolds, or sometimes fitted diapers together without needing pins. 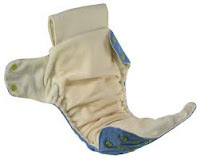 Hook & Loop – This is the term used to describe diapers with Velcro like closure. One Size – Abbreviated OS. These diapers can be pockets, fitteds, AIO, or AI2/Hybrids. One size means that the diaper is adjustable so that it will fit babies from newborn to toddler. 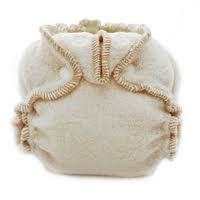 Doublers/Boosters – An extra insert, which can be added to the diaper usually by laying inside the diaper. The extra insert adds absorbency to the diaper making it either last longer or work better for heavy wetters. Liners – Can be either made of paper or cloth and is used to give a bit of stain protection as well as easier poop removal. Longies – A wool diaper cover, which usually looks like pants. TPU – Thermoplastic Polyurethane, a waterproof material that is heat bonded onto fabric. Softer feel then PUL but must not wash in hot as it will make it not as durable. 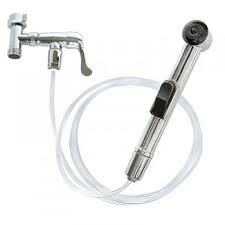 Diaper Sprayer – A sprayer that is attached to the pluming of your toilet to make removing solids from cloth diapers easier. Cloth Wipes – The cloth alternative to disposable wipes. Can be made from terry cloth, flannel, bamboo, velour, etc. 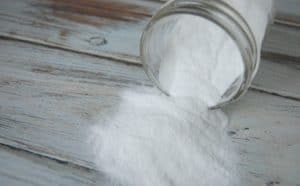 Can be used with a wipe solution or just water. 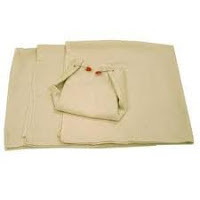 Pail Liner – A fabric bag used to keep a diaper pail inside. Usually made with PUL so that it is waterproof. 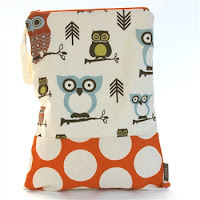 The bag can be easily removed and washed with cloth diapers diapers. Wet Bag – A fabric bag with either a zipper or drawstring closure so that you can place dirty diapers in the bag while you are out and about. Some families choose to use a wet bag at home instead of a pail and pail liner. I had never heard of hybrids but they sound great for outings… How natural are the disposal linings? Are there chemicals similar to what's in disposable diapers? Kylie – Most of the hybrid disposable inserts still contain SAP (the yucky stuff in disposables. 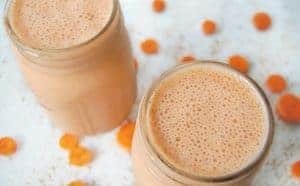 However, they are at a much lower amount. GroVia and Flip (both big AI2/hybrid brands) have 3 grams of SAP compared to 10-20 in a disposable diaper. They really are the middle of the road diaper. Using a disposable insert would be better then a disposable (in all areas) but still nowhere near as great as cloth inserts. So for the AI2's do you find it easier to just toss the diaper to clean or remove the lining? I would be worried that if I would just take out the lining that the cover may be wet also and cause issues with my daughters health. I am just trying to figure out if we decided to go all in with this, if we should buy just the diapers or just a few covers and put more into the liners. For my AI2's I just take out the inserts and keep the same shell. (unless of course the shell is visibly/noticeably wet or dirty. Some AI2's actually have wipeable shells others do not. Usually it's really easy to tell if the shell is wet. If you do go with AI2's I generally recommend buying as many inserts/liners as you'd want for diapers (standard is 24 diapers for 2 days worth….so you'd want 24 inserts/liners) then buy about 6 shells. 3 shells a day and 12 inserts a day is usually plenty. You can always add on more shells if/when you find you need more. I orginally started out with 6 shells and 18 inserts. It worked fine but 18 inserts means those diapers go through heavy use and they've started to wear out now.. (although it wasn't till about 18 months that I noticed the wear) so if you want your diapers to last a long time, more is better.